God is my portion, and my cup: Faith -- Do Not Be Afraid, God Will Fight For Us! Joshua was a young man, when he was picked up by Moses. Joshua was Moses’ most favorite assistant. When the people of Israel were still at Rephidim, the warriors of Amalek attacked them. Moses asked Joshua to assemble an army of Israel to fight back against the invading Amalek army of warriors. Upon Moses’s command, he quickly went out and chose warriors from the Israelites. The following day, he led his warriors, and fought the army of Amalek. Moses stood up at the top of the hill, holding the staff of God in his hand, and prayed to God. 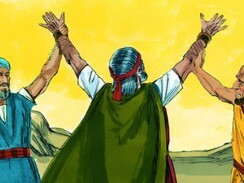 What a blessed scene – Moses was praying to God at the top of the hill, and at the battle ground, Joshua defeated the army of Amalek with his chosen warriors. The battle continued. As long as Moses held up the staff in his hand, the Israelites had the advantage. But whenever he dropped his hand, the Amalekites gained the advantage. Moses’ arms were getting tired so that he could no longer hold them up. So Aaron and Hur found a stone for him to sit on. Then they stood on each side of Moses, holding up his hands. So his hands held steady until sunset. As a result, Joshua overwhelmed the army of Amalek in battle. God gave the victory. Joshua fought, and Moses prayed. Then God Himself fought against the Amalekites. This was what God did – He fought for His people and gave the victory against the enemy attacked His people. God was always with His children, and God himself protected them against all enemies. Joshua saw and experienced God, who fought for His people. The one who really fought was God, not himself or the Israel army of warriors. Since then Joshua continuously held tight this belief. Not long time later, the Israelites arrived at the Promised Land. Joshua was sent as a spy to explore the Promised Land with the other eleven spies. Indeed, only were Joshua and Caleb able to see God’s hand and God’s promise that was about to be fulfilled. They were even thankful to God for leading them to the land that God promised. 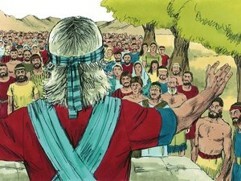 The other ten spies also reported back the goodness of the Promised Land. However, they sternly warned the Israelites about the impossibility of occupying the Promised Land because the land had been already occupied by the strong people living in fortified cities surrounded by the great walls reaching to heavens. Even the giants who had never been defeated lived in the land. 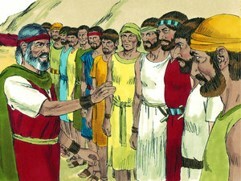 The ten spies stole the hearts of the entire community of Israelites. They complained and blamed God. Due to their unbelief, God had to send them back to the wilderness. On the other hand, Joshua had to suffer for the next thirty-nine years in the wilderness not because of his fault, but because of unbelief of his fellow Israelites who sided with the ten spies without faith in God. However, he had never forgotten the Promised Land. He firmly believed God and His promise. Through his faith, he could come back to the Promised Land, although the unbelieving generation was perished in the wilderness. In fact, he came as the leader of the Israelites, and under his leadership, the Israelites finally got into the Promised Land. 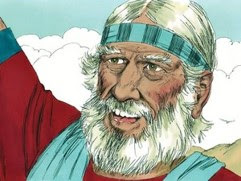 He firmly believed the power of God, and he had faith that God would fight for the Israelites. The first city, Jericho, which was most formidable ever, was defeated by God as Joshua believed. However, Joshua was not perfect. He failed before Ai, which was a much smaller city. His eye was deceived, and he forgot God. He took his own initiative without asking God. Then he failed miserably. Upon the failure, Joshua humbled himself before God, and carefully listen to God. Through his obedience, a victory came again. He learned from God. His humanness, however, did not leave him completely. He was again deceived by a couple of Gibeonites, who brought a deception by disguising them as if they had been a long journey to Joshua. After examining evidences, although it was a deception, he believed. He was fooled by his own wisdom, and he fell again. The greatness of Joshua was this: after the two painful lessons, he had never been forgotten the lessons from God, which were, in fact, caused by himself in both cases. Then Joshua always put God before him, and he faithfully and humbly followed God. (How many painful lessons do we need to be like Joshua who had never forgotten God only after two lessons? Definitely not me. I need more than two truly painful lessons. God has been truly patient with me. This is one of the reasons why I fully trust my God. God loves me always.) With this solid faith that was hardened by God, Joshua continued leading the Israelite, the God’s people. The men did as they were told and mapped the entire territory into seven sections, listing the towns in each section. They made a written record and then returned to Joshua in the camp at Shiloh. 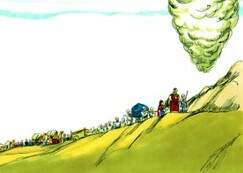 And there at Shiloh, Joshua cast sacred lots in the presence of God to determine which tribe should have each section. Please note that the grants of land of the seven tribes were yet to be conquered. So far, Joshua only conquered the land that was enough for two and half tribes, and seven tribes needed their land to settle, which was still occupied by the same strong people living the fortified cities with the walls reaching heavens. In other words, Joshua only conquered 1/3 of the land, and still 2/3 of the land were to be conquered. Even this harsh reality, Joshua was still the Joshua who strong and courageous as God initially commanded to him. For all his life, he had been firmly believing God and His promise while fighting against his fear inherent to him as a human being for the stronger enemies who already lived in the land, and the peer pressure from the other ten spies that could squash him and easily extinguish the fire of his faith in God. In faith, Joshua prevailed again and again even his old age. If our leader calls us, and tells that we go out survey, and divide the land so that his/her team occupy. So far, under the leadership of our current leader, so far we have conquered 1/3 of the land. And the 2/3 of the land are still occupied by a much stronger people who would not welcome us. They also lived in fortified cities surrounded by the great walls reaching heavens. What would be our reaction? Certainly, it would be very difficult to follow what was asked by the leader. However, the twenty-one spies (three from each of the seven tribes) did immediately got out and surveyed. Yes, the job itself was dangerous. Despite of the danger, in faith, they completed the survey, and divided up the land as Joshua commanded. How was this possible? The answer was the Joshua’s faith that had never shaken before many impossibilities in his life. Joshua kept his faith in God despite of all kinds of odds, hindrances, challenges, hardships and impossibilities. The people of Israel saw Joshua who was truly faithful. Yes, one person’s true faith never compromised was so influential that the entire community of Israel also believed. Although 1/3 was conquered so far, they believed the rest (2/3) would be conquered also because the rest of the land would not be conquered by the power of the people of Israel, but the power of God. Faith is the key. 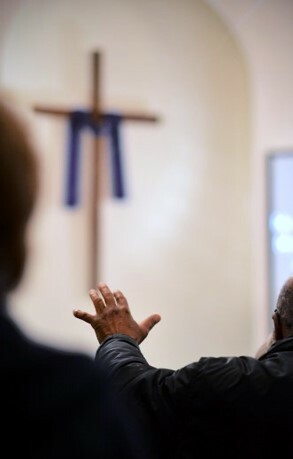 Do we really have an unshakable faith in God? In other words, do we believe God and His promise under any circumstances, i.e., what we see now and what we think what would happen in future do not agree with God’s promise. Our faith is the confidence that what we hope for will actually happen; it gives us assurance about things we cannot see. (Hebrews 11:1) It is true that we cannot see what God sees. God sees and knows the future that we will meet. Thus, we cannot be as wise as God for our future. Additionally, He dearly loves us. He wants to provide and actually grants us the best. Why? Even our earthly father, who is not perfect, knows how to give the best to his children because we dearly love them. Then how much so for God to us, Our True and Ever-Loving Father? Please don’t be afraid of anything on earth because God will protect and fight for us. Joshua was strong and courageous in God, and so should we be in Him.